Why We Should Create A Website For Our Business ? 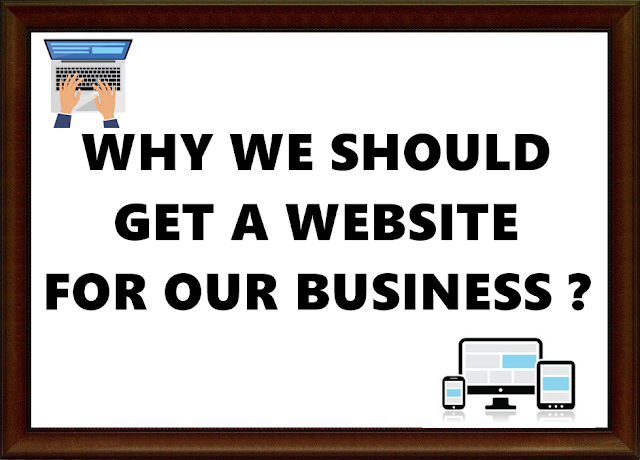 To us, a website is important for a business no matter whether small or big. Why we say so? If this were the only reason on the list, it would be enough. Six out of ten consumers expect brands to provide online content about their business on some form of digital property, and more than half head straight to the brand’s website for product information. If you don’t have a business website, today’s digital-savvy (and impatient) customers may look elsewhere. Take a look at this list of specifics that customers say they want from a business website. This is the most important for us too. We more prefer looking and buying products from a website. 90% of consumers claim that online reviews influence their buying decisions. You could rely on Foursquare, Yelp, and other review sites to host reviews for your brand, but you can kill two birds with one stone on your own website. Since potential buyers are already looking for you online, including customer testimonials on your site is a great way to impress potential buyers. It is true that you cannot control what others say about you on social media channels, but you can influence public perception by creating your own story via a business website. A company blog helps business owners get their message, mission, and personality in front of their target audience faster than print ads or snail mail brochures. Plus, social icons linking to Facebook, Twitter, Instagram, and other networking platforms make sharing your content easier for your visitors who like what they see. Consumers typically start their buying journey with research and recommendations from peers and social network connections. Studies show that once a consumer has an idea of what they need or want, they start researching, and 72 percent of them go online to find educational material, reviews, and testimonials, according to a recent report. So if you’re not staying competitive with your competitors, you’re giving shoppers a reason to buy from another brand. Nobody wants to work at 3am but some people like to shop then. Having a business website or e-commerce store means that you can sell products all the time — not simply between 9am and 5pm. An online store can mean a dramatic boost in sales, especially when you factor in additional customers who are not restricted by geography. Also, your online presence also supports marketing campaigns, customer service, client relationship building, brand recognition, and almost every other element of the revenue stream. Then, you need to combine your website with marketing tools like email marketing to helps you reach new customers and generate repeat business. Consider this: 81 percent of consumers perform online research before making a purchase. This is also means they go to Google and type in one or more keywords, like “best leather shoes” or, if they know what they want, “handcrafted Italian leather women’s shoes in Los Angeles.” If you don’t have a website for your business, the chances of showing up on the search engine results page (SERP) are zero. But if you have a site, you can optimize it for search engines, thereby increasing your chances of appearing at the top of Google’s results and getting more visibility with potential customers. You also can improve your site with SEO (Search Engine Optimization). If you haven’t created a website for your business, let we help you by our Smart WebDesign package which is included creating Facebook page for your business. Contact me – 0187674068 (Miss J) or you can check our website for more information – Smart WebDesign Big Domain .